Ian Blackford has said Scotland must have the right to determine its own future. Scotland must have the right to determine its own future and choose to be an independent nation within the EU, according to Ian Blackford. The SNP's Westminster leader repeated his frustration and criticism of the Westminster Government's Brexit strategy and insisted Scots are "sick and tired" of being told what to do by Theresa May. 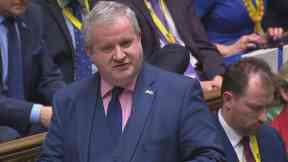 Speaking as MPs considered how to approach Brexit plan B, Mr Blackford told the Commons: "Let me be very clear - Scotland must no longer be left at the mercy of events. "Whatever happens here, the SNP will not be dropping its policy of independence. "And whatever turmoil and hardship this Tory Government tries to drag our nation through, Scotland will and must have the right to determine its own future - to choose to be an independent nation within the European Union. "I can see members shaking their heads because they're running scared - like the Prime Minister, they fear they would lose an independence referendum. "Well, the Scottish people are sick and tired of being told what the Prime Minister wants them to do. "Scotland's needs are much more important than what the Prime Minister wants. "Scotland needs the power to take its own decisions. "That's the only way we can stop the Tories dragging us off the cliff edge and into disaster."